Note: Surgery yesterday went about as well as having someone deliberately cut you open and drill holes in you can go. My left collar bone has now been re-attached to my shoulder using ligaments from a cadaver, which means that it is technically a Zombie Shoulder. So if I suddenly start liking it when celebrities walk on screen from nowhere, I will blame my left (or sinister) hand. In the meantime, I’ve got a lot of couch time ahead of me, and since I am semi-loopy on legal heroin right now, blogging about cartoons seems like the right thing to do. The variety segment and the “Love-Matic Grampa” are both excellent parodies of their respective genres, but for me the standout here has always been “Wiggum P.I.”. Even as a kid I hated laughtracks, so I never watched a lot of sitcoms, and I was just a few years too young to get over-exposed to the likes of Osmond family variety shows. But I watched plenty of Magnum P.I., The A-Team, and Riptide (a swiftly cancelled bad idea that was cool to seven-year-old me because they had a big helicopter and a freakin’ robot). My hands down favorite was Airwolf, which had a Voltron style stock intro they used whenever they fired up the helicopter at the end to blow up whatever hapless kidnapper/smuggler/generic bad guy was on that week. These shows were bad and dumb for a lot of reasons, but they’re near perfect parody targets because they were Swiss-watch level repetitive. Here in the days of serialized dramas it’s easy to forget that the thousands and thousands of episodes of those old detective and mystery shows were almost entirely one-offs. (A two parter with a cliffhanger was a once or twice a season exception.) Each story had to wrap up completely at the end of the episode so they could be syndicated out of order, which meant that they followed a rigid template. First there’s a crime of some kind, or some “old friend” of one of the main characters (never heard from before or since) who needs help. From there we get a skirmish or two with the bad guys, which would usually end with someone or something that needed rescuing. That was followed by the required Act 2-3 break, which was very show specific. On The A-Team, they would make a plan and build some stuff while the theme music played, on Airwolf they would go get in the helicopter. Then there would be a chase or a fist fight, and then it would end. 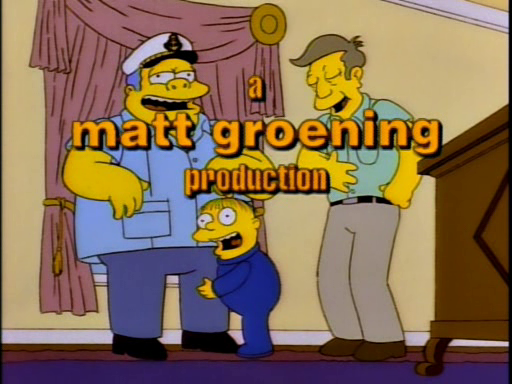 “Wiggum P.I.” follows these guide posts to the letter. The bad guy gets introduced, then Wiggum gets the corked gator, then Ralph gets kidnapped, a few henchmen get dispatched, then there’s a chase and things are left to reset for next week. The source material was so easy to deconstruct that they could get the whole story into seven minutes of screen time. That efficiency stands in marked contrast to that 30 for 30 episode Zombie Simpsons did earlier this year, or that American Idol episode they did a few years back, or that Portlandia one. All of those shows have their own repetitive quirks, and brisk seven minute parodies would work a lot better than trying to stretch things over a full twenty-two minutes. Any Zombie Simpsons attempt to parody them would probably suffer from the usual problems regardless of length, but even in Season 8 it would’ve been tough to build a whole episode around a concept with as few parts as 80s detective shows. Happily, they didn’t try. End note: I think the above all makes sense, but, as mentioned above, milk of the poppy is coursing through my veins right now, so if it’s gibberish, I apologize on behalf of the opioids. Happy 20th Anniversary to “The Simpsons Spin-Off Showcase”! Original airdate 11 May 1997. “What do you suppose the rent is on a hideout like that?” – Wiggum, P.I. “Start eating?” – Wiggum P.I.